If you could only have one, which one would you choose? 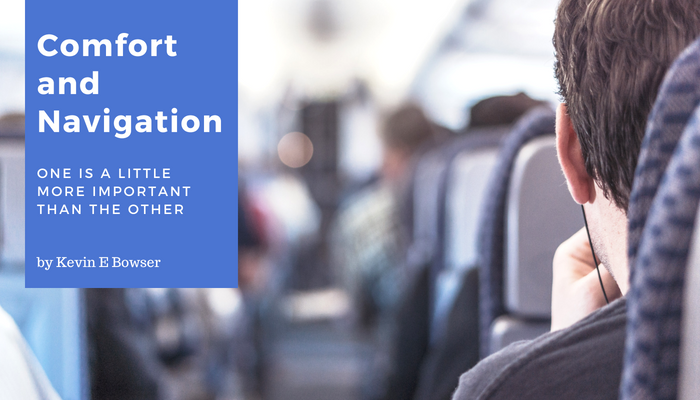 Coaching young leaders, and coaching those who aspire to lead, gives me incredible opportunities to take a look at all of the combinations of skills and traits that make up a great leader. Recently, I was in a conversation with a young leader who has a fair amount of both. But I was postulating on the evidence that would suggest that most leaders are either strong or tough. But, usually not both. Never go to the internet with a question like that unless you want a college level physics explanation! However, my questions on this topic are not addressed from a metallurgical perspective. These two terms, when combined, are most often mentioned in metallurgical discussions on toughness, elasticity, and fracturing. My thoughts are more physiological. 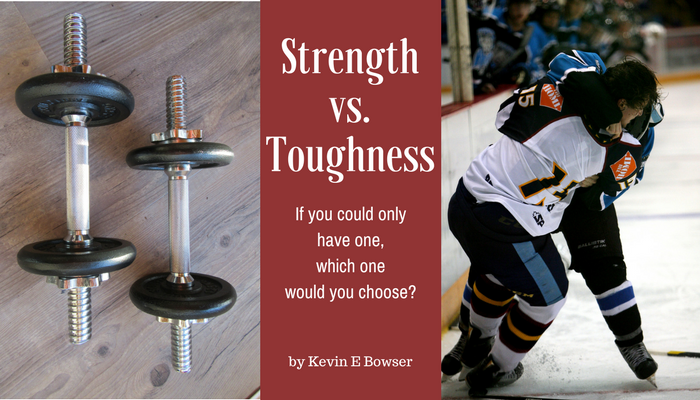 Consider for a moment the strength of the powerlifter and the toughness of the hockey player. Both are incredibly skilled in their particular athletic endeavor. Yet, they are built very differently and could not compete on equal footing if either of them were to cross over into the other’s athletic domain. Perhaps that is the very observation that has sparked the global “CrossFit” craze. But, I digress. Strength is a great attribute to possess. More than one young man has flexed a muscle when a pretty young lady walked by. Strength is universally valued and has applicability to many aspects of life. But go back to the example I used to represent strength. It was a powerlifter. When I think of strength, I am reminded of Vasily Alekseyev, the Olympian from the former U.S.S.R. He was the holder of 80 world records and the April 14, 1975 cover of Sports Illustrated proclaimed him the “World’s Strongest Man.” He weighed over 350 pounds. I watched him in the 1972 and 1976 Olympics many times walk up to a steel bar with hundreds of pounds of iron plates on each end. He would lean over, get a grip, and then lift it over his head for about a second. He would then drop it and nod to the judges and walk off the stage. In all likelihood it would be a new world or Olympic record. But could he have run a marathon or played ice hockey at an Olympic level? Probably not. No, but, I am probably certifiable! I had a vigorous debate several days ago with a recognized leader for a global organization. He oversees a region of more than 100 local affiliates. He is a “legit” leader. There is much upon which we agree. And there is much upon which we do not agree when it comes to leadership and leadership development. One topic of debate for us on a recent afternoon was on the value of certification when it comes to some of the tools or methodologies that are prevalent in leadership development today. I am a huge proponent of some of them and consider myself a bit of an expert in one or two of them. 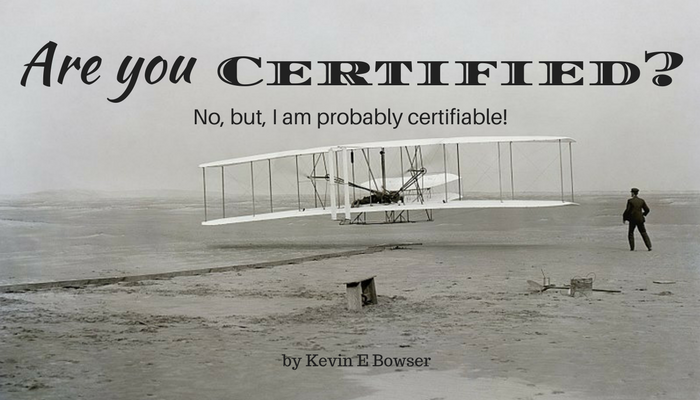 I just have never bothered to become “certified.” The leader that I was discussing this was fairly adamant in the necessity and value of certification. That, of course, got me thinking and pondering. Do you suppose anyone ever asked the Orville and Wilbur Wright if they were certified aeronautical engineers? History tells us that they were actually tinkerers and small business men with a passion for flight. They gained the mechanical skills and experience necessary for their ultimate success by working for years in their shop with printing presses, bicycles, motors, and other gadgets. Some of which they invented or otherwise modified and improved. Their work with bicycles, in particular, influenced their belief that an unstable vehicle like some sort of flying machine could be controlled and balanced by a person with enough natural talent, skill, and practice. Did you get that? They believed, as do I, that talent, skill, and practice are what really matters when it comes to increasing the potential for success. Not certification! Let’s look at one more guy that was not certified. Consider Thomas Edison for a few moments. Edison, “The Wizard of Menlo Park”, has been called “America’s Greatest Inventor.” Here is a kid who only attended school for a short time and ended up being homeschooled by his mother with much of his education coming from reading rather than formal education. Yet he has given us the phonograph, movie camera, and the lightbulb, just to name a few. And his legacy lives on in the form of General Electric which made the inaugural Fortune 500 list and debuted in the top 10 on that list. Not bad for an out of work telegraph operator and a seller of candy and newspapers on the railroad. What made the Wright brothers and Edison successful? Advice from Tom Brady that we all need to hear. I have two favorite professional football teams. They are the Houston Texans and anyone who beats the Patriots. I don’t like their coach. And I don’t like their quarterback. But, when Tom Brady speaks the truth, I must acknowledge it. Here is a little more of what Tom Brady had to say to the ESPN reporter. What does it mean to be demanding? When referring to a task, the dictionary says it is about requiring much skill or effort.When referring to a person it says it is about making others work hard or meet high standards. So, why the negative connotation to the word demeaning? One of the things sorely lacking today is any semblance of high standards and expectations. We don’t have any for those who lead us. And we don’t often have any for ourselves when it comes to our own performance. 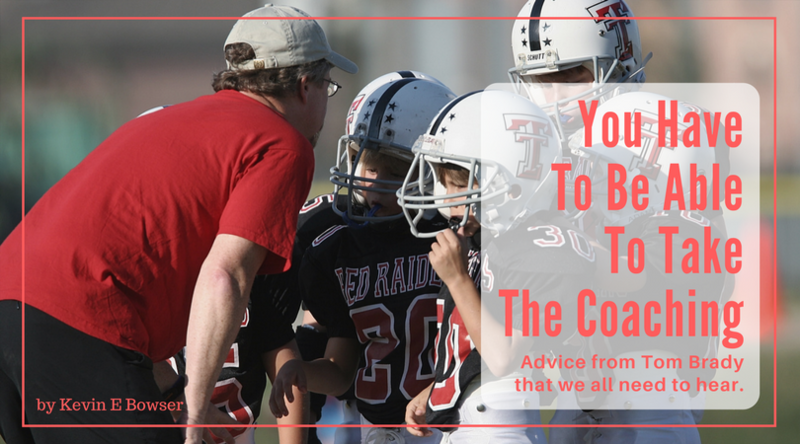 Is there value in having a demanding coach? The Texas coast is bracing for a storm that may be of historic scope and size. And if the predicted rainfall amounts are anywhere close to being accurate, we are in for quite a storm and associated flooding. We may have flooding in Houston similar to what we saw in 2001 when Tropical Storm Allison visited Houston, left for a day and then returned and stalled for a day and dropped up to 40 inches of rain on an area of the country that is as flat as a pancake. And more recently, we are bracing for an impact like we experienced from Hurricane Ike in 2008. One of the public figures that emerged prominently from Hurricane Ike was an elected official named Judge Ed Emmett. I will not bore you with the details of our political system here in Texas, but, trust me, a County Judge holds a prominent position in Houston and he had a great deal of influence as Hurricane Ike was approaching. His guidance was a direct result of the disastrous situation 3 years prior when Hurricane Rita came through and folks fled the city in such numbers that the highways gridlocked and many people were stranded on the highway with no way to move forward and no way to turn around. Several died in the ensuing traffic jam. A total of 110 people died during the “exodus”. He was trying to get people to avoid the mistakes of the recent past where many fled who really did not need to. This resulted in many who did need to evacuate being unable to do so. 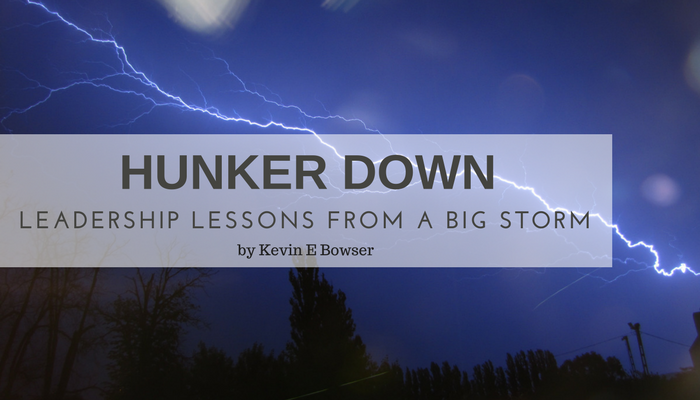 There are several leadership lessons that we can take from these events in the past and the one that is bearing down upon us right now. The President, not the State! I am enjoying a little respite from the hazy, hot, and humid Summer in Houston, TX. And my beloved bride found an inexpensive getaway to Oregon and Washington. Besides Lewis and Clark, we have seen a lot of profiles of George Washington’s face on many road and highway markers. And that reminded me of some thoughts I had a few years ago on leadership lessons we could learn from General, and later, President George Washington. We, who live in the United States, have studied George Washington since first grade. We think we know a lot about him. But I am not sure that what we think we know is really historically accurate. I hope that there is more to George Washington than that silver dollar and that cherry tree. Washington was many things. And most of all he was indeed a leader. He was the ideal man to lead the newly formed American Continental Army and then later to lead the newly formed United States as the nation’s first president. He developed his leadership skills from an early age and he had a distinguished military career. He further honed them as a businessman and entrepreneur. Those leadership skills and abilities made him the wealthiest man in America by many calculations. And his leadership was ultimately tested in his later military career as he took a rag-tag militia and forced the greatest military in the world into surrender. But his testing and trials were not over as the nation elected him to be the very first president. 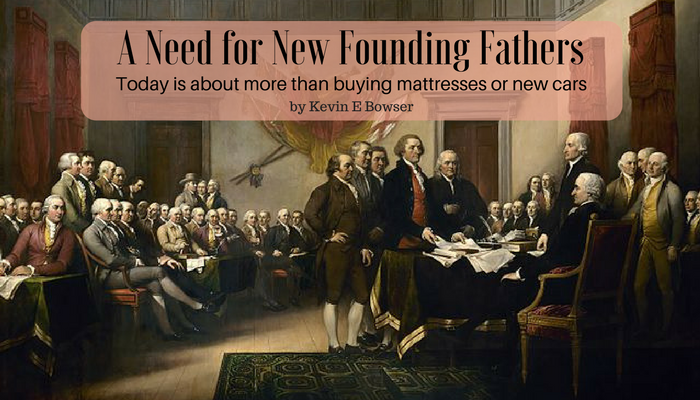 What can we learn from George Washington? 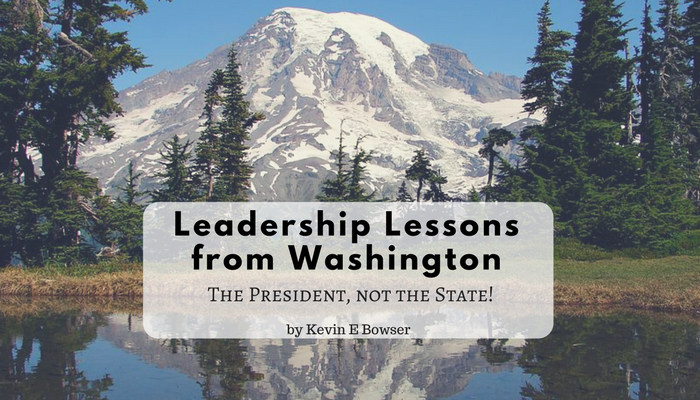 What can we learn from Washington’s leadership style and skills? Several things come to mind for me today. Consider the following. If that title doesn’t grab your attention, then nothing will. Our political and social structure here in the U.S.A. provides little context for the concept of being an exile. The closest thing that many in our society or culture can come to the ethos of being an exile is the practice among some cultures where one is shunned under certain conditions. But, even that does not really comport with our modern sensibilities. What do I mean by “Exile”? 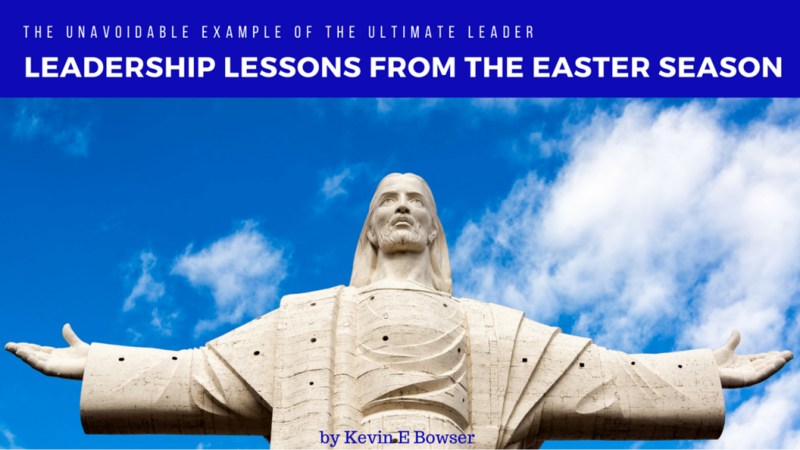 So, what do I mean when I use the word “exile” in the context of leadership? To be clear, I am not using that word within the context of a forced departure or a violent takeover that leaves the deposed leader nowhere to go but into hiding in a barren land or to the relative safety of a benevolent benefactor. 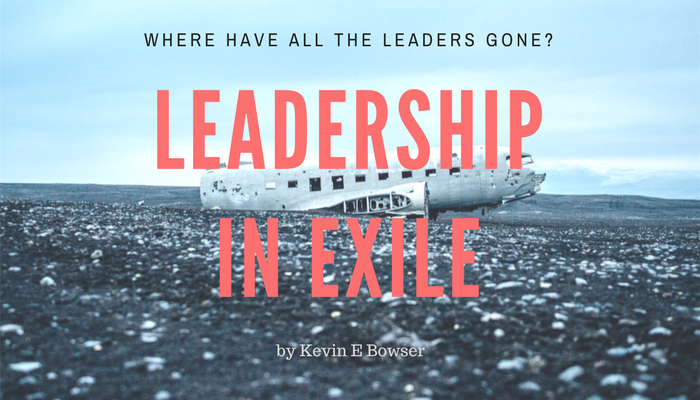 Instead, I think that I really should be using the term – “self-exile.” Because I believe that there are many leaders who have taken themselves “out of the game” when it comes to leadership. They have opted to, in a sense, go underground and not seek to be a visible or vocal leader. Perhaps that is the greater question? Why are they choosing to vacate their responsibility or opportunity to lead? Consider the following as some reasons that leaders have self-exiled. I have seen all week on many of the social media sites that I frequent, that it (Memorial Day) is “not about the BBQ.” And that is certainly true. Today is so much more than an excuse to frolic in the pool and eat as much red meat as possible. It is easy to get caught up in the activities around Memorial Day and to forget exactly why the holiday was created: to honor those American men and women who died during combat. To put it as succinctly as I can, Memorial Day is for the American troops who didn’t get to come back home and drink a cold Coca-Cola at a homecoming party or march in a parade in their little hometown. There are many out there like me that never wore the uniform of our Nation and never served on the battlefield. And I, like many, do not know with specificity the experiences and feelings that you have had. So, I will simply say “Thank you!” from one member of this grateful nation. 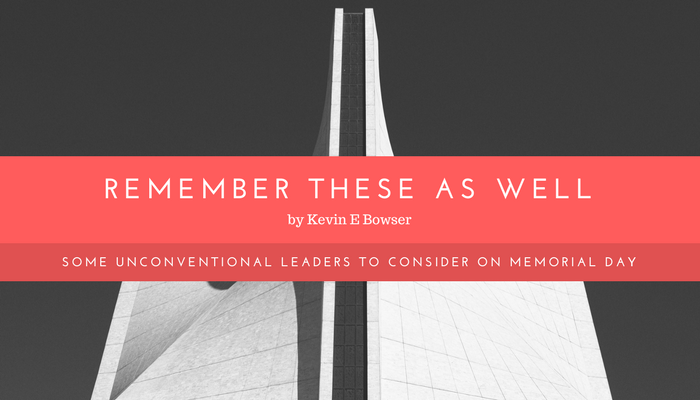 But, we would do well to remember some other fine examples of leadership. Two are no longer with us. And one is still alive today. We would do well to reflect on and remember some historic leaders outside of the U.S. Military that have made an impact on this world and on the cause of freedom, liberty, and prosperity. Consider just a few today. Margaret Thatcher — She was was Britain’s first female prime minister. 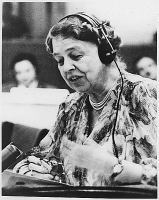 She was known for her tough uncompromising, conservative political views, and became nicknamed “The Iron Lady” as a term of both reverence and derision. She, along with Ronald Reagan, forged a relationship with Mikhail Gorbachev that brought the Cold War to a peaceful conclusion.